A slender bird with a long, distinctly patterned tail and white throat and breast. The back and head of the Yellow-billed Cuckoo are a plain grayish-brown. Consistent with its common name, the stout, somewhat curved bill is primarily yellow (the upper mandible is mostly black, with some yellow, while the lower mandible is yellow in its entirety). The boldly white and black patterned outer tail feathers, or rectrices, which from underneath give the appearance of 6 large white spots, can generally be observed during perching and in flight. The rufous primary feathers of this cuckoo are largely only visible in flight. The bird is generally 26 to 30 cm in length and weighs an average 55 to 65 grams (Hughes 1999). Females are slightly larger than males. The feet of the Yellow-billed Cuckoo are similar to that of the woodpeckers; they are zygodactylous; the two outer toes point backward while the two inner toes point forward (Hughes 1999). Characteristics of the Black-billed Cuckoo (C. erythropthalmus), may cause some uncertainty in identification. In addition to a completely black bill, however, the Black-billed Cuckoo has a buffy throat, small distinct white tips on the rectrices (not large and obvious as on the Yellow-billed Cuckoo), little to no rufous on the wings, and a red orbital ring around the eyes. The juveniles are more easily confused (see Hughes 1999, for a comparative description of juvenile birds). 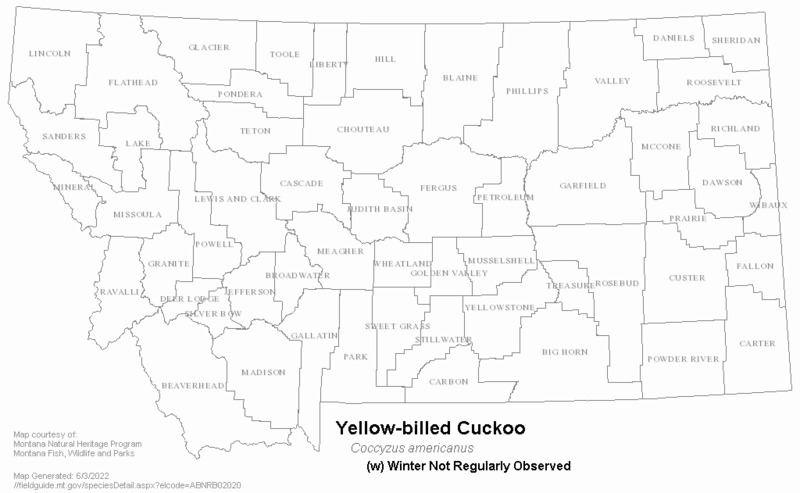 Little to no information regarding Yellow-billed Cuckoo migratory patterns exists for Montana. Of the few records containing any details on the month of observation (many of them are historic records with limited detail) the Yellow-billed Cuckoo is known in Montana only in June and July (Montana Bird Distribution Committee 2012). All of these observations indicate no behavioral evidence to suggest breeding. No systematic censuses have been performed and no other information is available on migration. Throughout their range, preferred breeding habitat includes open woodland (especially where undergrowth is thick), parks, and deciduous riparian woodland. In the West, they nest in tall cottonwood and willow riparian woodlands. Nests are found in trees, shrubs or vines, an average of 1 to 3 meters above ground (Harrison 1979). Western subspecies require patches of at least 10 hectares (25 acres) of dense, riparian forest with a canopy cover of at least 50 percent in both the understory and overstory. Nests are typically found in mature willows (Biosystems Analysis, Inc. 1989). This bird is rarely found at higher elevations (Johnsgard 1986). 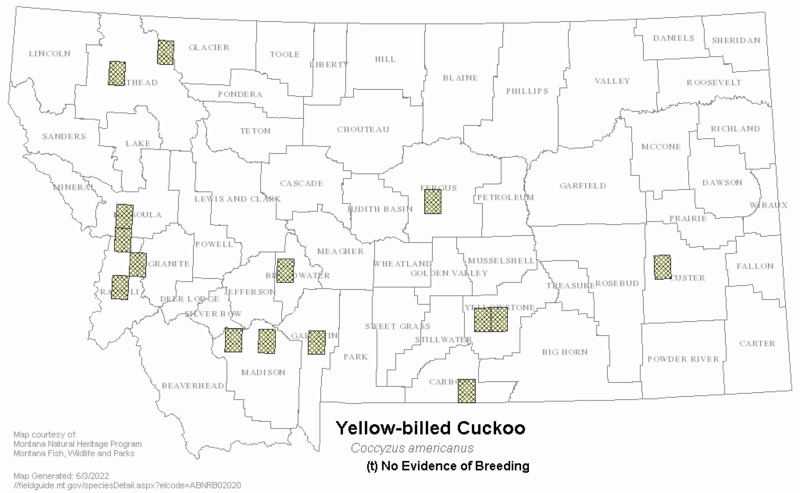 No information is available specific to Montana, but in other parts of their range the main diet of the Yellow-billed Cuckoo is caterpillars. Other insects, some fruits, and sometimes small lizards, frogs and bird eggs are also consumed (Terres 1980). Food is gleaned from branches or foliage, or the Yellow-billed Cuckoo sallies from a perch to catch prey on the wing (Ehrlich et al. 1992). No ecological information for the species is known from Montana, but some information is available from studies completed in other parts of their range. Territory size averages 20 to 24 hectares (Riparian Habitat Joint Venture 2000). No records exist indicating direct evidence of breeding in Montana. Several observations, however, record behavior that indirectly suggests breeding (Montana Bird Distribution Committee 2012). Of the limited records (there are 18 records for the state), more than half of them are for observations of individuals showing no breeding behavior and are presumed to be transient (migratory) in nature (Montana Bird Distribution Committee 2012). Reproductive information from other locations within the species' range reveals breeding often coinciding with the appearance of massive numbers of cicadas, caterpillars, or other large insects (Ehrlich et al. 1992). Their light blue, greenish-blue or pale green eggs are smooth, non-glossy, and elliptical to subelliptical in shape (30 by 23 mm) (Baicich and Harrison 2005). Clutch size is one to five (commonly two to three) and is largest when prey is abundant. A clutch size greater than six eggs is attributable to more than one female laying in the nest (Hughes 1999). Incubation lasts 9 to 11 days and is shared by male and female during the day; the male incubates at night (Hamilton and Hamilton 1965, Potter 1980, Potter 1981). Young are tended by both parents and can climb in branches at seven to nine days. The Yellow-billed Cuckoo sometimes lays eggs in the nests of Black-billed Cuckoos (C. erythropthalmus) or (rarely) other species (Ehrlich et al. 1992). 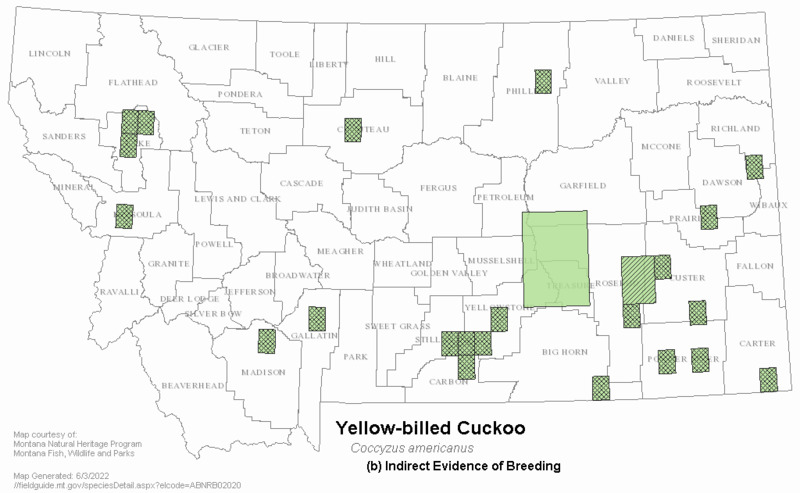 The western distinct population segment of the Yellow-billed Cuckoo was listed as Threatened west of the Continental Divide in Montana under the Endangered Species Act by the U.S. Fish and Wildlife Service on November 3, 2014 (USFWS 2014). In the listing decision, the U.S. Fish and Wildlife Service noted the primary factors threatening the western distinct population segment as loss and degradation of habitat for the species from altered watercourse hydrology and natural stream processes, livestock overgrazing, encroachment from agriculture, and conversion of native habitat. No critical habitat or special rules were included in the listing decision (USFWS 2014). Hamilton, W. J. and M. E. Hamilton. 1965. 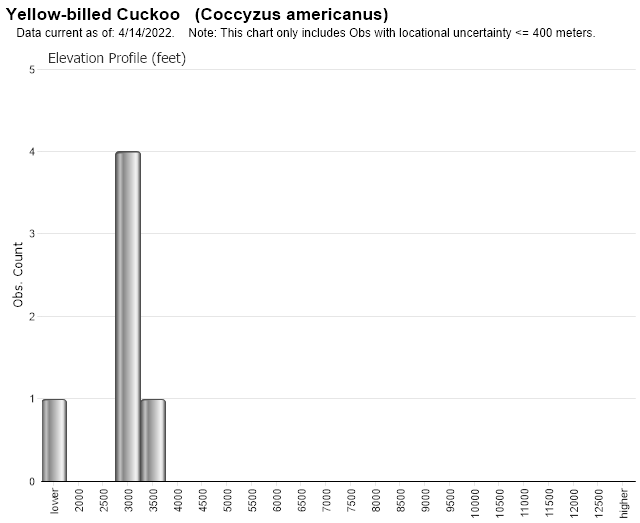 Breeding characteristics of yellow-billed cuckoos in Arizona. Proceedings of California Academy of Sciences 32:405-432. Potter, E. 1980. Notes on nesting yellow-billed cuckoos. Journal of Field Ornithology 51:17-29. Riparian Habitat Joint Venture. 2000. Version 1.0. The riparian bird conservation plan: a strategy for reversing the decline of riparian associated birds in California. California Partners in Flight. U.S. Fish and Wildlife Service. October 3, 2014. Endangered and threatened wildlife and plants; determination of Threatened status for the Western Distinct Population Segment of the Yellow-billed Cuckoo (Coccyzus americanus); final rule. Federal Register. Vol. 66, No. 210, pp. 54808-54832. Bancroft, G. T., A. M. Strong, and M. Carrington. 1995. Deforestation and its effects on forest-nesting birds in the Florida Keys. Conservation Biology 9: 835-844. Benton, R.M. 1987. The Yellow-Billed Cuckoo. Utah Birds 3:7-11. Decalesta, D. S. 1994. Effect of white-tailed deer on songbirds within managed forests in Pennsylvania. Journal of Wildlife Manage. 58: 711-718. Faanes, Craig A. 1982. Northern Great Plains Region. American Birds. 36(6): 991. Faanes, Craig A. 1983. The Nesting Season: Northern Great Plains Region. American Birds. 37(6): 999-1001. Hunter, W.C., R.D. Ohmart, and B.W. Anderson. 1988. Use of exotic saltcedar (Tamarix chinensis) by birds in arid riparian systems. Condor 90:113-123. Kepler, C. B., and A. K. Kepler. 1978. Status and nesting of the yellow-billed cuckoo in Puerto Rico. Auk 95:417-419. Laymon, S. A., and M. D. Halterman. 1987b. Can the western subspecies of Yellow-billed Cuckoo be saved from extinction? Western Birds 18:19-25. Preble, N.A. 1957. The nesting habits of the yellow-billed cuckoo. Amer. Mildl. Nat. 57:474-82. U. S. Fish and Wildlife Service. 2000. Notice of 90-day finding for a petition to list the Yellow-billed Cuckoo as Endangered and commencement of a status review. Federal Register 65(33): 8104-8107. U. S. Fish and Wildlife Service. 2001. Endangered and Threatened Wildlife and Plants; Re-opening of the Public Comment Period for Status Review of the Yellow-Billed Cuckoo in the Western United States. Federal Register 66(6): 1633-1634. Web Search Engines for Articles on "Yellow-billed Cuckoo"